November 08, 2018 – In a fast-paced world where technology dictates most things, smartphones have become the must-have tool to enjoy the conveniences of the digital era. Infinix’s SMART series, designed to be an affordable entry level smartphone series, is set to debut an optimised SMART 2 HD. This is the third generation of SMART series which creates better efficiency and convenience to consumers. 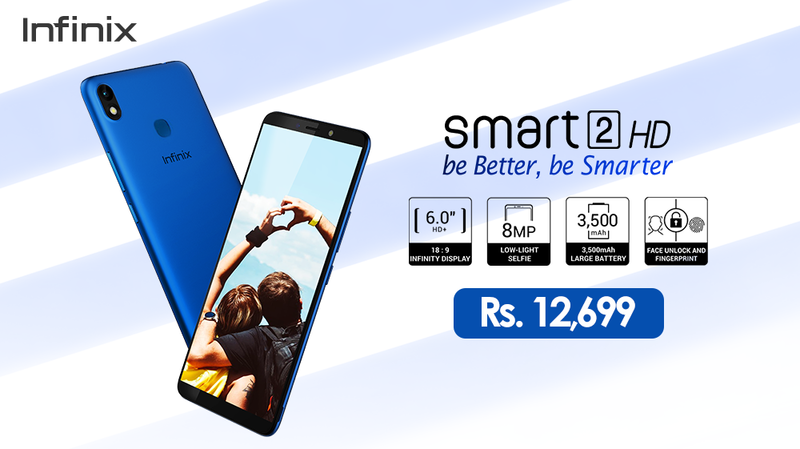 The SMART 2 HD features a 6.0” display, an 8MP selfie camera and a 3500 mAh battery. These features enable fantastic full view, fabulous selfies and a better boosted battery experience. Integrating technology and fashion, Infinix stays true to its brand story of creating intelligent stylish gadgets that resonate with the young generation, while ensuring affordability to its key target users in emerging markets. 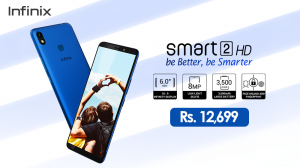 The mobile phone will be available to purchase at Daraz.pk and will retail at a price of PKR 12,699. Infinix SMART series is the affordable smartphone designed with an understanding of the economic challenges presented in emerging markets. In addition to creating the best value for money solution, Infinix SMART 2 HD puts together the most sought-after specs to give consumers the best experience. 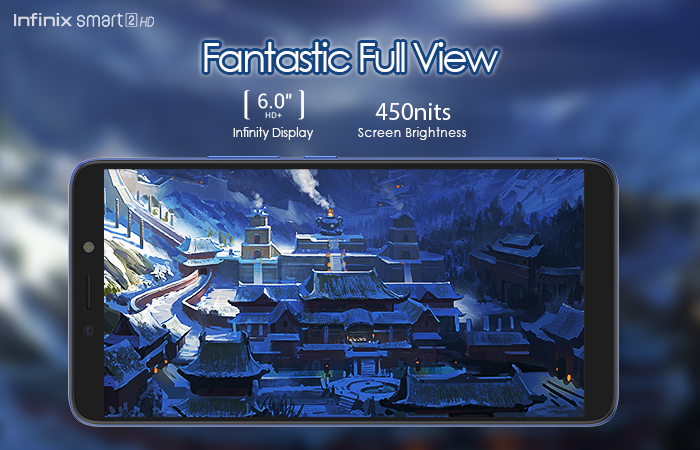 The 6.0” infinity display changes the field of view by expanding it significantly for more vivid pictures. Infinix has a reputation for quality camera in emerging markets, a trend that SMART 2 HD maintains by giving clear pictures. The vivid pictures are facilitated by the 8MP low-light selfie camera. The selfie camera has been integrated with AI features to refine image qualities according to current trends and modern requirements, giving consumers the power to be truly smarter and better. Every good quality camera phone comes with the challenge of battery life. The better the images, the higher battery consumption rate. Long battery life is another feature that the Infinix brand is respected for. SMART 2 HD has an almost perfect solution for this challenge with the 3500mAh battery power. Embedding a simple but strong 3500mAh battery power, Infinix stays true to its identity by guaranteeing its consumers what they need. “In the digital age, smart is the new charm which powers up consumers and provides fantastic experiences. With the SMART 2 HD, Infinix brings to the market the perfect device for the smart, individualistic youth of today seeking an affordable solution to stay connected and stand out from the crowd,” said Marketing Director, TRANSSION Pakistan, Vane Ni. The SMART 2 HD features Face unlock and fingerprint sensor locks, maintaining and protecting your privacy from information vultures. You do not need an expensive phone to have the “Face unlock” function anymore as Infinix Smart 2 HD offers this amazing feature at an affordable price. Infinix is committed to continuously integrate style and technology for intelligent lifestyle experiences to be enjoyed by young consumers in emerging markets. 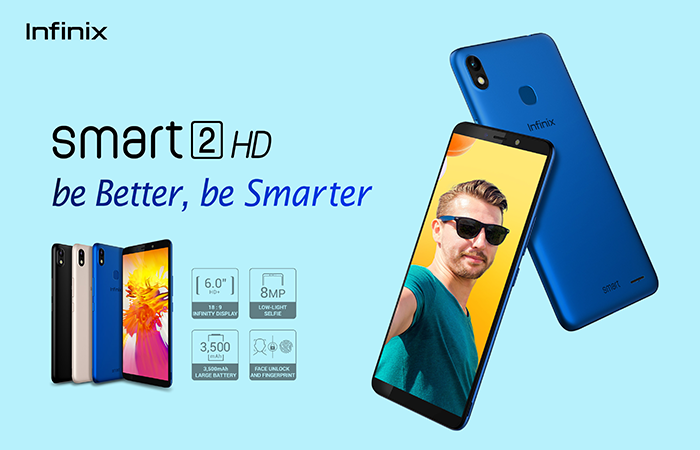 SMART 2 HD is for those striving to being better and smarter.